Plant it and the butterflies will come! This 100% pure wildflower seed special collection includes 10 varieties of wildflowers that are the most enticing to butterflies. Includes Shasta Daisy. Purple Coneflower, Gloriosa Daisies, Bachelor Buttons, Larkspur, Clarkia, Aster, Wild Marigold, Black-Eyed Susan and Coreopsis. Bonus! 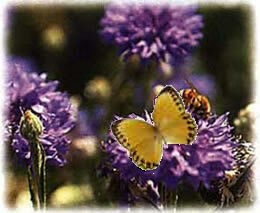 "The Family Butterfly Book"
People Magazine heralds Rick Mikula as North America's "Butterfly Evangelist." Within the more than 160 pages of this beautifully illustrated book you will find hundreds of color photographs. You will learn not only how to identify and care for butterflies, but you are carefully instructed on how to create your own mini-environment to attract butterflies. Complete with instructions for family-type activities revolving around these interesting creatures of nature, this book is a must for the beginner as well as the lepidopterist! Easy to read, entertaining, and scientifically correct. Great for gift giving! Get the free Family Activity Kit at right!